Greetings friends of Frilly and Funkie. I'm back today to kick off another edition of our Sunday linky party, Sunday Share. I know a lot of you are shopping at The Funkie Junkie Boutique. How about sharing your creations using items purchased from the boutique here on Sunday Share. There's a nice juicy 25% discount coupon in the offing each week. If you are already a customer, you already know about the fun items and fabulous prices at The Funkie Junkie Boutique. Wouldn't it be great to shop next time for 25% off those already great prices? 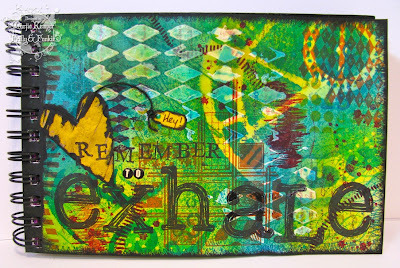 For a chance to win, all you have to to is link up any piece of artwork (card, mixed media, altered project, tag, etc.) that has not previously been shared here at Frilly and Funkie. Just be sure to mention my shop and Sunday Share in your blog post that you link to and your entry will be complete. We only had three people (and thanks so much to all three of you!) at the party this week and Random.org has selected #1 Claire as our Sunday Share winner. Claire shared this vibrantly colored beauty with us this past week. 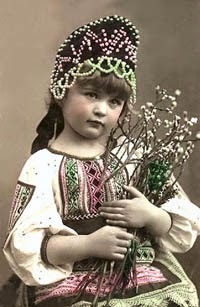 I definitely see some Venise Lace from The Funkie Junkie Boutique and I think there is some crinoline too. 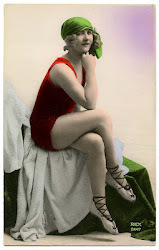 Great work Claire - CONGRATULATIONS and thanks for posting my shop badge on your blog. Please email me at thefunkiejunkie@gmail.com to get your shopping code (be sure to use 'the' at the beginning of my gmail addy - the guy who owns funkiejunkie is getting a bit testy because he keeps getting emails meant for me :). What is Sunday Share all about? Since this blog is sponsored by The Funkie Junkie Boutique, we want to have a place where our customers can share what they have made with items from the boutique. 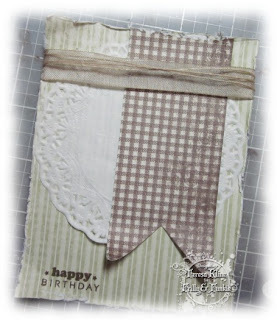 It's a linky party and you can share any creation here that has not been shared on this blog. It does not need to be a new project but you cannot share the same thing here more than once. In your post, please provide a link to my Funkie Junkie Boutique. If you need some guidance in knowing how to share your work here, read this post and let us know if you need further assistance. Thanks again to all who played in Sunday Share this past week. 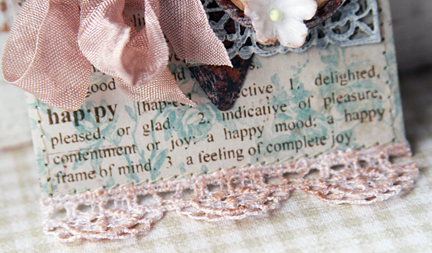 Hello Frilly & Funkie fans, it is Teresa Kline bringing you today's step by step. I am going to show you how I make my bows. 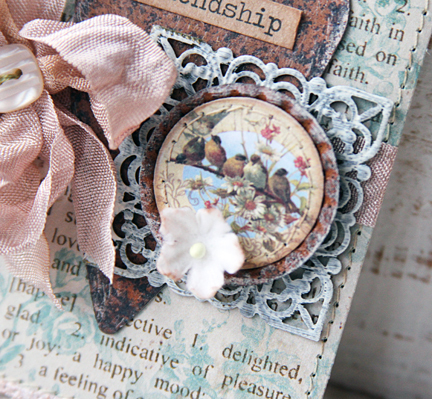 I have used white seam binding that has been dyed with Tim Holtz Distressing Ink. I used the ink pad and a sponge to add color to the white ribbon. 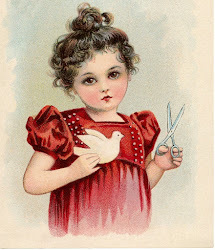 Here I am showing the ribbon across the card before I add the bow. I attach the ribbon to the back of the card with my tape runner. I pinch the ribbon in between my fingers making as many loops as the size bow I want. Today I have made only two loops on each side of the bow. Once I am finished with the loops, I cut a smaller piece of ribbon, lay it across the center of the bow. I then flip it onto my work surface and bring the ends up and tie it all securely together. I tie it tight and cut my ends to the desired length. Here is my completed card and below a list of all the Funkie Junkie products I used...happy shopping! Oh, I almost forgot don't forget to check out the gorgeous new lace.....swoooooon...I am luving these new laces and they are on sale.....wow! Good Friday morning friends! Today I am sharing with you, a little pocket that can be filled with a gift card, chocolate, a note, etc. The product I am focusing on is metal embellishments. Linda has such darling little metal embellishments in her boutique, some rusty, some antique bronzed, different shapes sizes and themes. 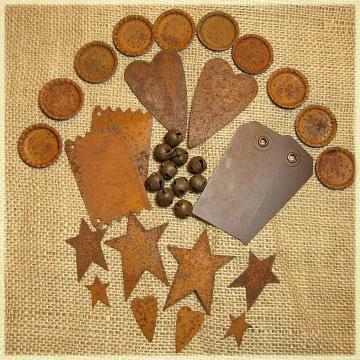 My favorite is the Rusted Metal Embellishments. I love every single piece in this assortment pack! The bottle caps, hearts, stars and oh my... the bells! But, I'm guessing you would like for me to get on with my project... right? 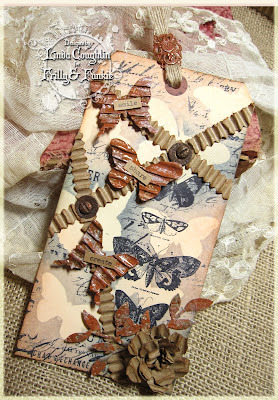 The thing with the Rusted Metal Embellishments is, you do not have to do anything to them... they have all the charm and shabby look to them. I used the large heart and one of the bottle caps then, brushed the outside edges with a little paint (vintage white) the brush was almost dry... meaning not very much paint. Next, I used a square piece from the Mega Metals Value Set, these are antiqued bronzed filligrees. I brushed it with the same paint, only using a lot more paint. For the bottle cap, I just punched out a circle from an image (using a one inch circle punch), machine stitched around the circle and adhered it to the inside of the bottle cap using a pop dot. There you have it, my favorite product focus (not that we are suppose to use our favorite but, I just had to let you know). 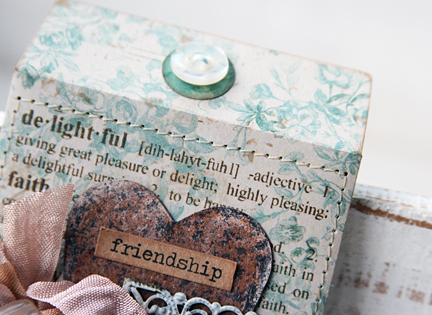 I wish I could share more than one product with you... the Sizzix Pocket Envelope Die is fabulous too! Right now everything in the boutique is discounted 10% for the Memorial Day sale. Starting Tuesday, May 29th, we'll revert back to our normal Friday Focus special and the rusty and filigree metals will be 15% off. Hello Frilly and Funkie friends. 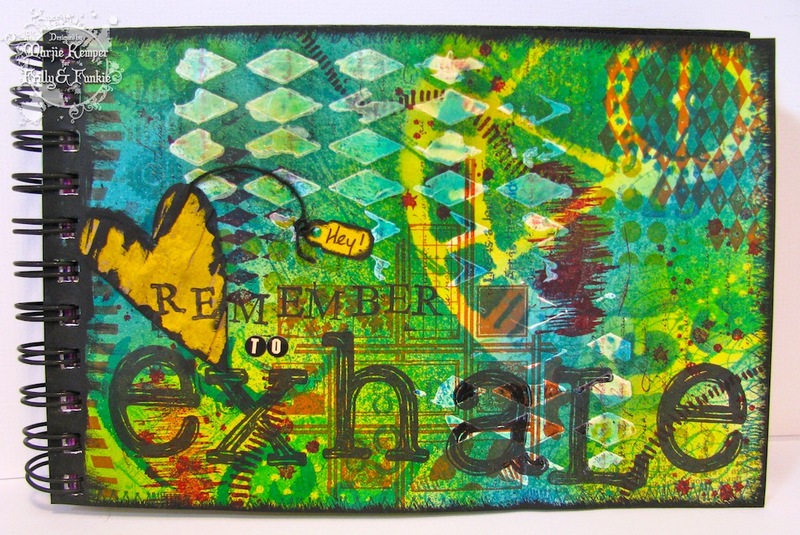 It's our second week of the Stencils & Masks challenge. This week, our Funkie designers are sharing their spin on it. Please visit their individual blogs to read all about how they have created their projects. Stencils and masks are readily available whether store-bought or home-made. You probably have more of them on hand than you realize! 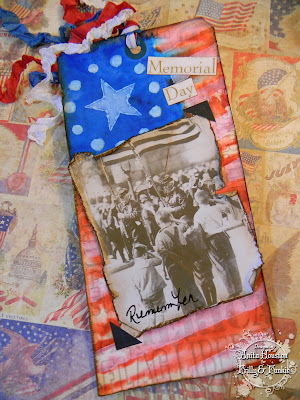 This challenge is open through Tuesday, May 29, so pull out your stash and make something, link it up to share with us... and put your name in the hat to win a prize. The Design Team's pick will get the Funkie Favorite badge and there will be one random winner receiving a $15 gift certificate to shop in the Funkie Junkie Boutique. Hello, Frilly and Funkie Fans. We are thrilled with all the altered art you shared with us for the last challenge and will announce the winners on Monday. Now for the new challenge: this week we'd like to see you use stencils and/or masks in your artwork. Use a purchased stencil or mask, or create your own. 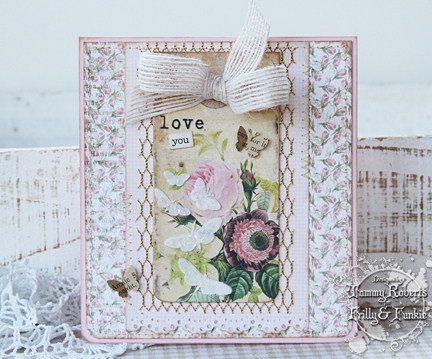 It's easy to do using positive/negative space from die-cuts, stamps, punches or your own hand drawn doodles and drawings. The possibilities of what you use with your stencil or masks are pretty extensive. Many of us are inky crafters. Some are fond of paints, ink sprays, gesso, chalk... even plain old water does some pretty amazing things through a stencil. We can't wait to see your creations! We'll have two winners ~ one random choice winner will receive a $15 gift certificate to spend at The Funkie Junkie Boutique, and the design team will pick a favorite who'll receive our winner's badge for display on your blog. Remember, our challenges run for two weeks. This week the Frilly side of the team has the spotlight, with the Funkie gals to join in next Wednesday. You can enter in either style at any time, regardless of which side of the design team is being showcased. Please visit the DT blogs for details on how they've created their pieces. 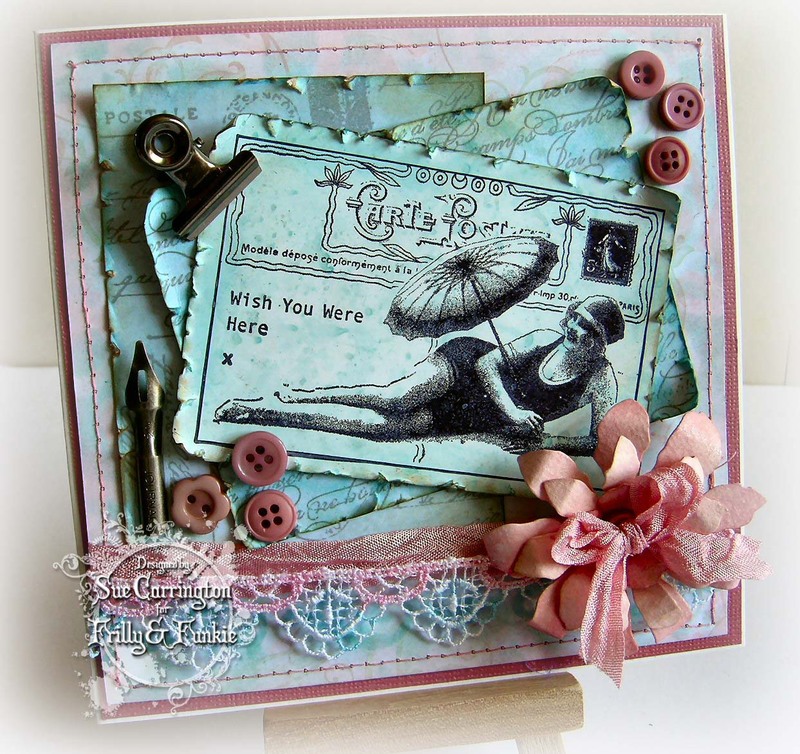 Whatever your style, Frilly or Funkie, you are welcome to play along with our vintage inspired challenge. You may upload your project at any time. If using a public forum, please use keyword F&F. Please be sure to provide a link back to our challenge in your post. Please do not submit work that does not contain a stencil or mask, and please please please be sure to turn off your Word Verification so our design team can leave comments on your blogs. Holy moly, did we ever have some super stunning altered projects entered into our last challenge! What a tough time the design team had in picking the overall winner. Thank you so much to everyone who played along with this challenge. We visited all your blogs and really enjoyed each and every entry. 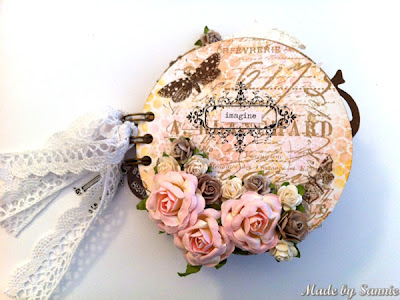 Unfortunately you can't all win, so we have picked #11 Sandra from Made by Sannie as the Funkie Favorite for the Alter It! challenge. 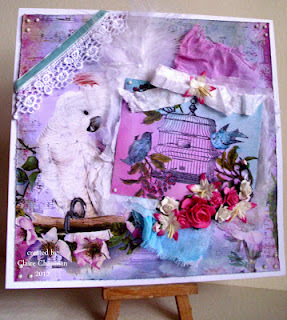 Sandra altered CDs and created this absolutely gorgeous shabby style album. Sensational eye candy, Sandra! Congratulations!!! And for our random pick winner, Kate from The Scrap Yard was chosen by Random.org as the winner of the $15 gift certificate for shopping at The Funkie Junkie boutique. Congratulations to you, Kate. It's a great week to shop as your $15 shopping spree will go farther as everything is 10% off this week for the Pre-Memorial Day sale. Both winners, please email me at thefunkiejunkie@gmail.com for your winner codes. Thanks again to everyone who joined in our fun challenge. We hope to see you back for our Masking challenge this week. Hello friends! My apologies for getting this Sunday Share post up so late today. It's been a super busy family weekend. This week we only had three of you participating in Sunday Share. 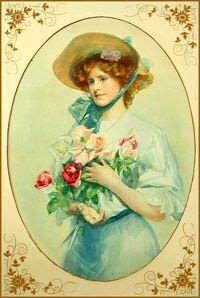 My heartfelt thank you to all of you for joining our linky party. You certainly did give us some delightful eye candy to look at. This week our Sunday Share random winner of the 25% discount coupon is Yvonne from Journey into Artistry. Look at this delightful card she made to celebrate her DIL's birthday. Yvonne used white burlap from the Funkie Junkie boutique and a corrugated heart I die cut and sent as a thank you with her order. I just love the corrugated cardboard I sell in the boutique! Congratulations Yvonne! We have a 25% discount coupon for the Funkie Junkie Boutique for you to use the next time you shop in the Zibbet boutique. Please email Linda at thefunkiejunkie@gmail.comfor your coupon code. I sure hope you are all doing well and ready for the weekend! Many times, I have blogger friends ask me about my backgrounds and so I thought I would share a couple. First I would like to let you know that I experiment frequently and some of you may know, but others may not, Alcohol Inks will work on somewhat porous surfaces. Now first they have to be primed, like the plastic bottle I altered and used Kilz Primer or as with this white card stock a Black Paint Dabber was used to prime the surface. Cover the white card stock with the Black Dabber and then use a sponge to blot and smooth the coverage, next use the heat tool to dry. Once dry cover with the alcohol inks and mixative (Bottle, Stream, Meadow and Gold Mixative). I always like to heat set after each application. Next I used the Retro Circles Texture Fade, embossed, covered the raised areas with Walnut Stain, Frayed Burlap and Brushed Corduroy Distress Inks, heat set and die cut. The finished panel was added to chipboard using two way adhesive, prior to die cutting. I like to use several colors for this to give extra layers of color, so let each color show through. For the Honeycomb background (I love that folder), using a piece of two way adhesive, I adhered the Tissue Wrap. If you look close, it is all about traveling and yes, I purposely chose that section! 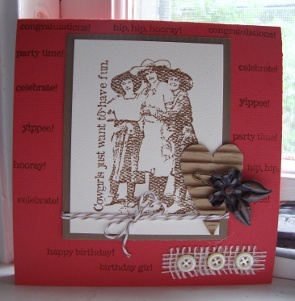 This was then inked with the new and fabulous Distress Ink colors, heat set and then embossed and again shaded with the Archival Sepia! The ends were distressed and inked with Walnut Stain. The little Chit Chat Stickers were shaded and backed with card stock. My metal kind of surf board is inked with Black, wiped off the top as we only want the sentiment black and then colored with alcohol inks (Latte Ginger, Meadow and Blending Solution). Tied a little thread and layered it up. Thank you so much for stopping by and I hoped you enjoyed this Saturday's Step X Step!